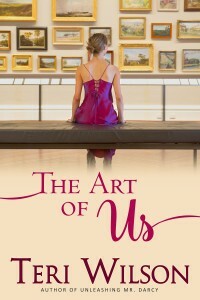 I’m really excited about my book for Tule, The Art of Us, which is a modern retelling of Pygmalion/My Fair Lady with a fine art twist. The heroine, Dr. Harper Higgins, is an art history professor and a Van Gogh scholar. She’s even got a one-eared dog named Vincent. (Aww, right?!) The hero of The Art of Us, Tom Stone, is a brooding former soldier. He’s also a painter. You can learn more about The Combat Paper Project at their website: www.combatpaper.org. I do hope you’ll give Harper and Tom’s story a read. They share an emotional, romantic journey of healing and renewal, because love is its own work of art. Teri Wilson is a romance novelist for Harlequin Books and Tule Publishing, as well as a contributing writer at HelloGiggles.com, a lifestyle and entertainment website founded by Zooey Deschanel and now a division of People Magazine. Teri is the author of UNLEASHING MR. DARCY, now a Hallmark Channel Original Movie. She loves books, travel, animals and dancing every day. Visit Teri at www.teriwilson.net or on Twitter @TeriWilsonauthr. Hang out with Tule’s Managing Editor, Meghan Farrell! Welcome to Tule Publishing. I loved your story! It was amazing! Thank you! Hi Teri! It’s nice to learn more about you and the inspiration behind your new book. I really enjoyed The Art of Us and look forward to reading more of your books soon. I loved The Art of Us so much that I looked for you on Amazon to order something else you had written. I now have Unmasking Juliet on my Kindle and I’ll be starting it tonight. To me, it felt like the art in the story was flowing into the words. I did not want it to end. It will be one of my re-read again stories. Hi Teri! I recently finished The Art of Us and loved it. I had a feeling the idea for Tom’s uniform collage was drawn from real life and was so pleased to find that it is. Thanks so much, everyone! I’m happy to be here at Tule and so thrilled with the nice reviews on this book. Thankful you’re covering our military guys. These kinds of therapies are incredibly helpful and oftentimes underrated. Welcome to Tule!! I’m looking forward to reading your book. I love the premise of your book and can understand how helpful this organization must be to soldiers who have returned from combat.